How to use the filter app? The Spotzi Filter App allows you to create advanced filters based on your data. This is very convenient if you quickly want to filter out data based on your characteristics. 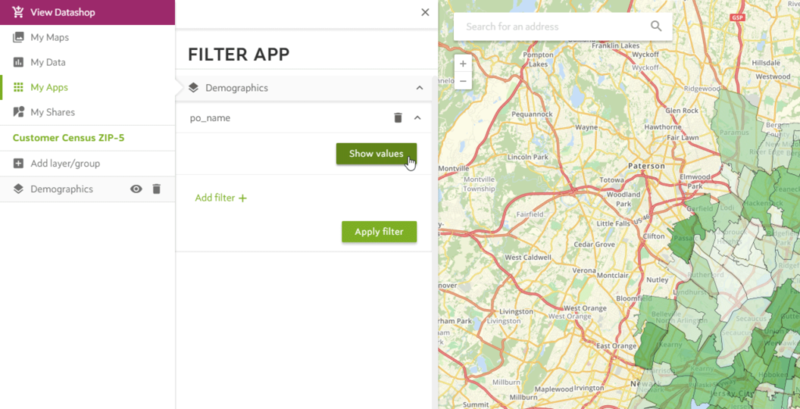 The Filter App is perfect for analyzing high-potential postal code areas or for creating interesting customer profiles of your data. 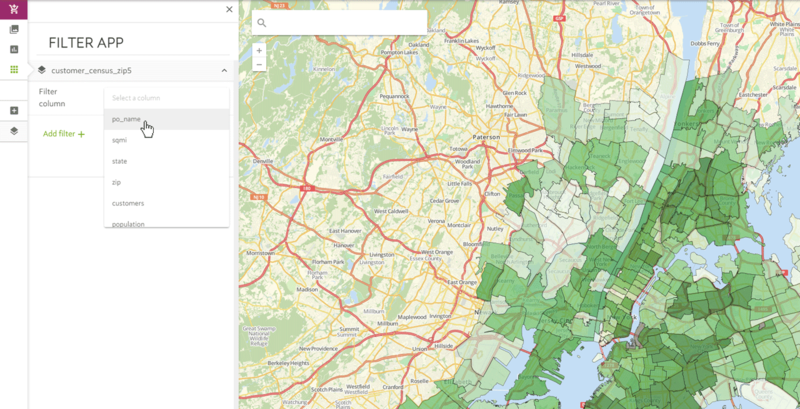 In this example we will filter a sample of the US 5-digit ZIP code areas dataset containing total population and the total number of customers in that area. We are going to create a filter based on the number of customers in that area. 2. Now open the Filter App. 3. Choose the column that you want to use for creating your filter. 4. Pick a range. In this example I pick the areas where the total number of customers is between 15,000 and 18,322 (maximum number). It is also possible to add multiple ranges to your filter. Keep in mind that you need a numeric field type in order to create ranges. This is well-documented in our article about data types. Remember that a postal code dataset sometimes contains postal codes of type text (string) . If you want to create a filter based on a specific postal code range you need to change the data type. 6. You have successfully added a filter to your map. 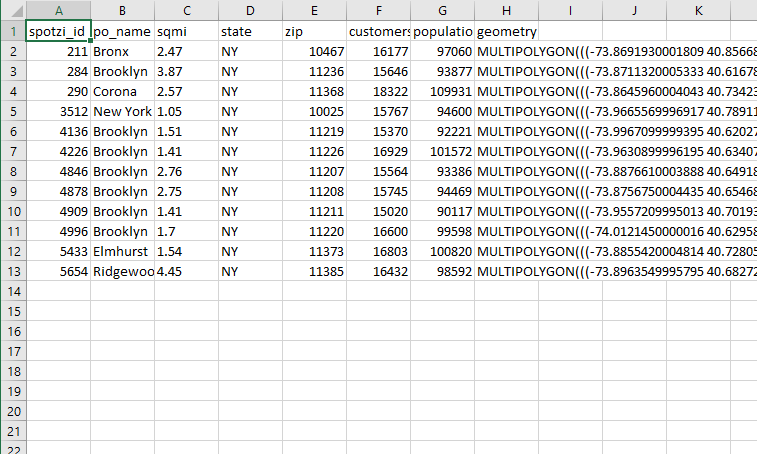 In this example we will filter a sample of the US 5-digit ZIP code areas dataset containing total population and the total number of customers in that area. We are going to create a filter based on multiple area names. 4. Click SHOW VALUES to open the list with all available values. 5. 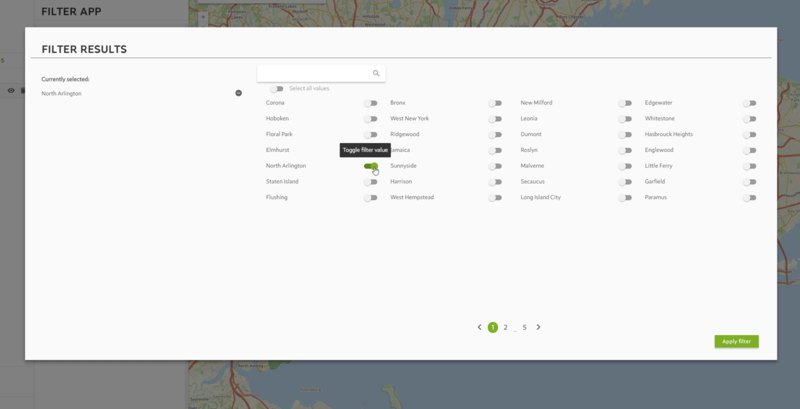 Select the areas you want to show on the map. 7. You have successfully added a filter to your map. 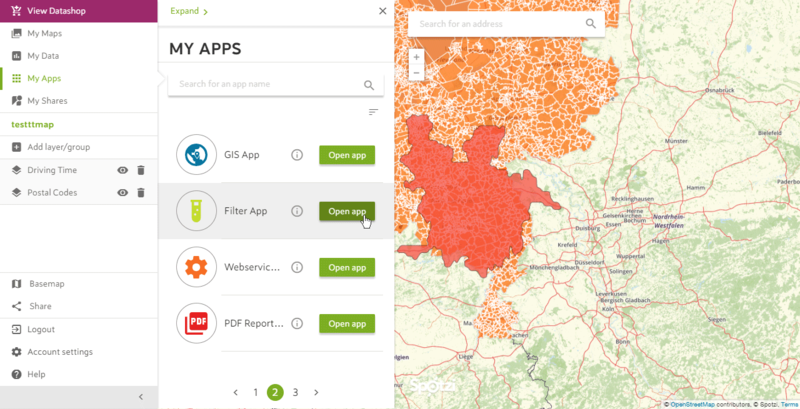 The true power of the filter app is the possibility to add multiple filters to your map. With these advanced filters you can filter and analyze data based on characteristics that are of interest to you. Create customer profiles based on your own custom filtering of the data and find out where your high potential customers are. In the following example we will create an advanced data filter of our 5-digit ZIP code map with population and customer data. 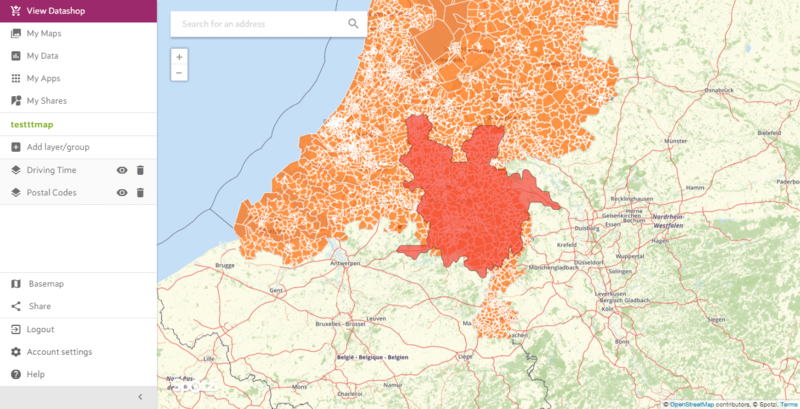 Within this dataset we will create a filter based on the total number of customers and the total population. 3. Choose the first column that you want to use for your filter. 6. Choose the second column that you want to use for your filter. 8. You have successfully added a filter to your map. The Filter App also has the possiblity to filter data by layer. This allows you to only visualize areas within a certain buffer or only the addresses within a certain postal code area. In this example we will try to filter all the postal code areas that are located within a 60 minutes drive time range. This data is generated with the Drivetime App. To achieve this you have to take the following steps. 1. Open a new map and add the map layer with a drive time range and postal code areas. 2. Open the Filter App. 3. Click the postal code map layer and select the filter by layer option. 4. Select the layer that you will use for the filter. 5. Press APPLY to confirm. 6. You have successfully filtered the data. 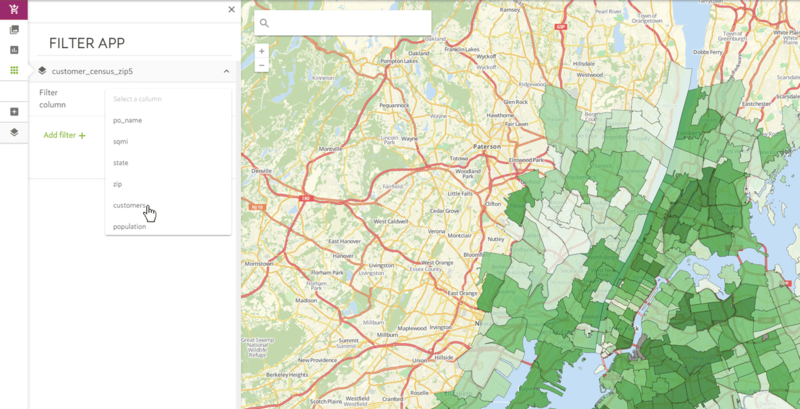 It is also possible to export your filtered selection to CSV, Shapefile, geoJSON, KML or XML. 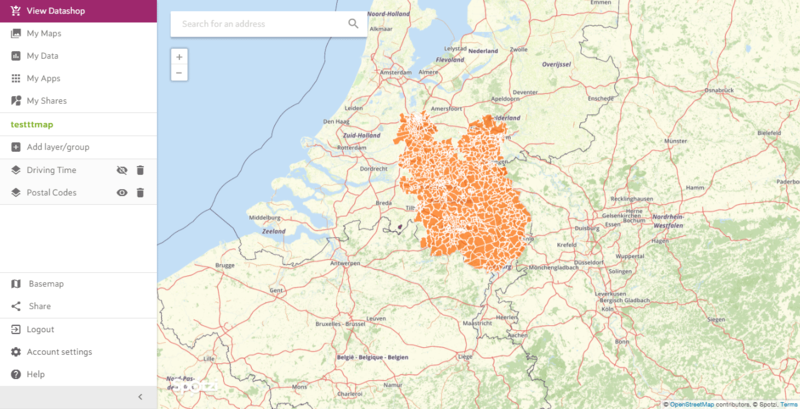 You can use these files to create filtered shapefiles of your data, but it is also possible to add these locations in bulk to your online marketing campaign (e.g. Google AdWords, Facebook Ads). 1. 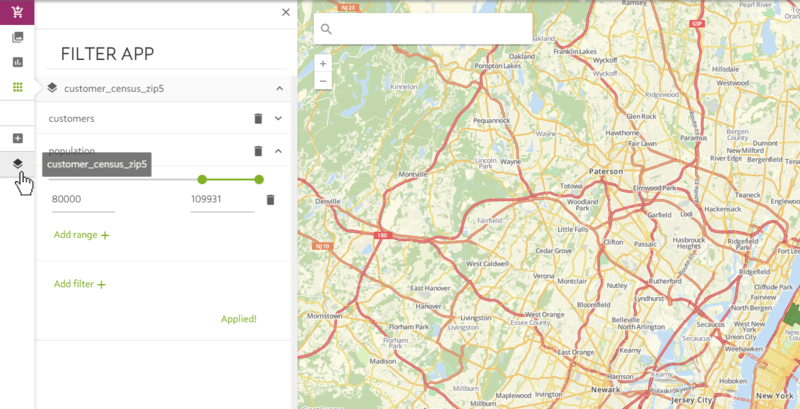 Open the map with your applied filter. 2. Now choose the map layer that you want to export. 3. Choose the export data option, select the data format and click EXPORT DATA. 4. You have successfully exported your data.